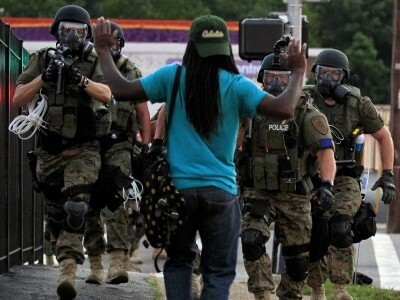 On Wednesday, the people of the United States and the world were shocked by the images coming out of Ferguson, Missouri. In response to the eruption of anger over the police murder of 18-year-old Michael Brown, the suburb of St. Louis was transformed into a war zone. SWAT teams decked out in battle fatigues and goggles descended on the city, wielding high-power shotguns and automatic rifles and driving armored attack vehicles. Peaceful protesters and journalists were confronted at gunpoint and attacked with tear gas, rubber bullets, rifle-fired bean bags and flash-bang grenades. The police imposed arbitrary curfews and issued dispersal orders without any legal basis. The forces involved may technically be local police, but what they are engaged in is essentially a military occupation. They look like the military, act like the military and have close ties to the military. Not only have police been armed with military equipment, they have been given a new set of rules. They are being trained to employ the methods used by the US and its allies in Afghanistan, Iraq, Gaza and Ukraine. The turning of Ferguson into an armed camp is not just about Ferguson. It is about the character of social and political relations in the United States as a whole. The veneer of democracy has been ripped away. This is what martial law looks like. The events in one relatively small suburb of St. Louis have suddenly exposed the reality of what has taken shape in the United States over the past 15 years. Following the stolen election of 2000, the ruling class used the September 11, 2001 attacks and the “war on terror” as a pretext to eviscerate every basic democratic right. The president declares the right to detain and even assassinate US citizens without due process. US spy agencies, in cooperation with the FBI and local police forces, monitor the political and social relations of every American. These measures have been accompanied by the establishment of the Department of Homeland Security and the US Northern Command. The latter was set up in 2002 as the first ever command overseeing military operations within the US. Planning for military operations within the United States are far advanced. As noted on the World Socialist Web Site Thursday, Pentagon strategy briefs on urban warfare include case studies for intervention in New York City. The principal “driver of instability” cited by the military is “radical income disparity,” a trigger for class conflict. Behind closed doors, there have been many discussions about the forms and mechanisms for full-scale military rule. The United States is presided over by a vast and unaccountable military-intelligence-police apparatus that functions as the guardian of the social and political interests of a new aristocracy. The official political institutions are hollowed out shells without any mass social base. All of this is overseen by a president who serves as a front-man for powerful corporate and financial interests. Five days after the murder of Brown, Obama was brought forward to deliver perfunctory remarks from Martha’s Vineyard, where he is vacationing. He had doubtless been warned by his supporters in the National Association for the Advancement of Colored People and by political fixers such as Al Sharpton that the situation on the ground in Ferguson was spiraling out of their control and threatening to trigger social protests in other parts of the country. Declaring that “Now’s the time for peace and calm on the streets of Ferguson,” Obama equated protests over the execution-style killing of an unarmed youth with a wave of police repression that has already resulted in the arrest of scores of people. The reality of American life exposed by the events in Ferguson cannot be covered over by Obama’s honeyed phrases. There is not “one American family,” but a society riven by class divisions. There is no “equality under the law,” but rather one law for the rich and another for the poor. Obama’s pretense of reverence for “the right to peaceful public protest” is belied by his expansion of the Pentagon’s multi-billion-dollar programs to militarize local police forces, including those in the metropolitan St. Louis region. The Ferguson police department is a participant in a federal program called 1033 that distributed $450 million in equipment to local police forces in 2013 alone. As for government “accountability,” Obama heads a government that has carried out countless illegal activities—from wars of aggression to domestic spying and torture. There is no accountability for these crimes, nor for the looting of the economy carried out by the banks and major corporations. Obama’s comments betrayed a high level of nervousness over the state of social relations in America. Nevertheless, he did not make a single reference to the desperate economic conditions that underlie the anger in Ferguson and throughout the country. Neither he nor any other representative of the American ruling class has anything to propose to address the growth of poverty, hunger and economic insecurity—except more repression. America is on a knife-edge. Social tensions, long repressed, are beginning to take open and explosive forms, and the ruling class has taken off its gloves. When the city of Boston was placed under virtual martial law following the Boston Marathon bombings last year, the World Socialist Web Site warnedthat a historical threshold had been crossed. The lockdown of the city “laid bare the modus operandi for the establishment of dictatorial forms of rule in the US,” the WSWS wrote. There were perhaps some who thought this evaluation was an overreaction. Had things really gone so far? What has been demonstrated on the streets of Ferguson is that yes, indeed, they have. The events of the past week must be seen as another sharp warning. Democratic forms of rule are incompatible with the continued existence of the capitalist system and its inevitable products—war and social inequality. The choice before the working class is socialism or dictatorship.